Well, I’ve been so busy over the summer that I haven't gotten much of a chance to share the awesome photo’s I've received over the last few months. I’ve been really blessed to work with some awesome people, especially this summer. One of the coolest things I've done was to create something for an HBO show launch. A little while back I was contacted by HBO to create a custom menu for a private dinner at the Tribeca Rooftop hosted by Perez Hilton for a new show, El Negocio, on HBO Latino. How cool is that? After looking at some of my previous menu’s and invites for inspiration she saw an invite I did for an Austin wedding on wood veneer and loved it. It is one of my favorites because of its uniqueness and the look on the persons face when they realize it is actual wood is priceless. People will always remember it! I knew this look would make an awesome menu for the launch party, so I was so excited they settled on it. After getting a little more information about the venue and color, we settled on a walnut veneer with a silver inlay. The texture and richness of the walnut along with the silver script brought together the elegance of the evening and provided, an often forgotten, element of design, texture. The menu looked amazing, especially in such an amazing setting! 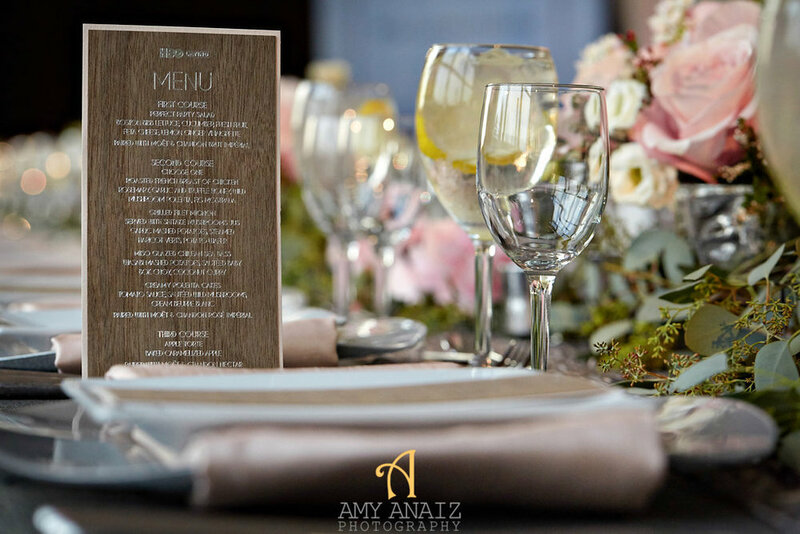 The event planners did a wonderful job, not to mention the talented photographer, Amy Anaiz, who took some stunning images of the event. Check out some of the photo’s below.